Hearing that Prince died felt like a strange experiment in time travel. When news of his death broke, Generation Xers like me reminded each other of our favorite Prince songs – the more obscure, the better. We reminisced on social media and watched MTV actually play music videos again. 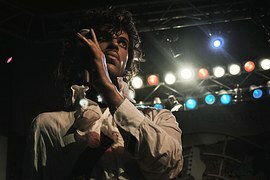 In the days following, an entire generation traveled back 25 years ago to when we played “Purple Rain” so many times that our boom boxes ended up unraveling the cassette, and in desperation we tried the pencil trick. Prince may be gone but his music is still here, and it’s music that Evan and I have been enjoying together. Evan loves music. Some of his first words were “car,” “star” and “yeah” – seemingly random – unless you’re a Beatles fan. Music had a way of calming him down when he was agitated and didn’t have the words to communicate his frustrations, wants or needs. When Evan was around five he ran over to the piano and played the same annoying tune that he had just heard blaring from the ice cream truck. We thought we’d discovered a savant talent. Turns out he was a one-hit wonder. For the last several years, Evan has been known to periodically write a song or modify lyrics. For example, when he was seven he modified the Rihanna song “Don’t Stop the Music” while we were on a Caribbean cruise. His version was “Please Don’t Stop the Cruise Ship, Cruise Ship.” I’m not sure if the clever lyrics or arm-flailing dance moves made it so funny, but it’s a song we all like to sing any time we’re on or near a boat. We call Evan our own Shazam because he can identify the title of a song and its artist after hearing it once or twice. I love that my son gets such pleasure from listening to music and, depending on his mood, it does so many things for him. It calms him. It makes him dance. It brings him joy and gives him something to talk about that most people can easily relate to. Music is his common denominator, and his tastes are broad and his knowledge vast. When Prince died, Evan was the only one who sat with me and watched videos of “1999” and listened to me ramble about driving around the neighborhood as I jammed to “Little Red Corvette.” He loved seeing so much purple (his favorite color). He was sincerely interested in hearing about the music and my experiences with it. It’s sometimes hard to connect with Evan on a topic of mutual interest. In fact, it can be hard to connect with any kid over a shared interest. I like cooking, traveling, playing tennis and sleeping. My kids enjoy Shopkins, Legos and Minecraft. And they definitely don’t like sleeping (or eating what I cook). Evan, in particular likes roller coasters. They make me sick and scare me, too. He likes talking about spider webs. Spiders gross me out. And, he loves watching YouTube videos of waterslides. I’d rather watch a baseball game. If you plotted parental interests and kid interests on a graph, they may never ever intersect. But, then there’s music. For Evan and me, it’s a common denominator – even if my favorite artists include Billy Joel and Elton John, and he likes The Weeknd, Ariana Grande and Alessia Cara. Oh, and he really likes Wiz Khalifa, too.